One set laminated Developing Lean Eyes communication exercise facilitator cards. One sample of each Developing Lean Eyes and Teaming with Success Participant Handbooks. The Developing Lean Eyes presentation is based on the Gestalt theory of group communication where "Learning to See What You Need To See" takes into account the various bits of educational bias and environment influence each member of a team brings to the group, and teaches each to look at the work environment with a new set of eyes. This presentation and exercise set reviews the Gestalt theories and how people communicate with each other verbally and non-verbally. It also teaches the advantage to a lean team when communication evolves to a high speed nonverbal level. It is aimed at answering questions about why team members are resistant to change and the gut level feelings that can defeat even the best of intentions. It helps develop an understanding of language, culture and communication issues that are barriers to team success, and shows team members how to learn to see the waste with a new perspective. The Lean Eyes presentation ends with a lead-in to the Learning to See the Waste two-step hands-on Car Factory simulation exercise. This exercise, facilitators guide and participant placemats are provided with each Car Factory Simulation Kit, purchased separately. Allow one hour for the The Developing Lean Eyes presentation and another 45 minutes to run the Car Factory Simulation. Either a Deluxe or a Companion Lean Factory Simulation Kit is required to test out the theories in the hands-on car factory exercise. NOTE: The Developing Lean Eyes presentation does not require Teaming with Success as a prerequisite and may be used as a stand alone event. The presentation starts with understanding basic communication skills and ends with the hands-on factory simulation focusing on seeing the process waste. Students learn how even a seasoned employee can find something useful in the Lean Principles, and how to transition their feelings about the old ways into becoming a lean champion. It is also good as a refresher for people who have been exposed to lean training but still have difficulty in understanding the intricacies of non-verbal communication, the bedrock which allows teamwork and Lean Principles to really come together to improve production flow. Part 1 and Part 2 of the event uses the Teaming with Success presentation which leads into group participation communication exercises, and Part 3 leads into three fun team building exercises using a survivor event scenario as the basis for exploring the team concepts presented in the training presentation. The Developing Lean Eyes presentation continues the communication concepts by presenting some brain teasers that show why miscommunication and sometimes hurt feelings occur when forming a team, and how understanding this phenomenon can actually help the team learn to correctly see and eliminate waste practices from their work area. This presentation is simple enough for anyone to facilitate using the included laminated participant placemats and facilitator guide, plus the speaker notes which are included in the PowerPoint slide set. Newly added, the package now includes a Train-the-Trainer Macromedia (TM) mp4 of the Lean Eyes presentation complete with animation and full narration of the PowerPoint slides and speaker notes. The mp4 can also be used as the presentation method leading up to the Car Factory Simulation exercises. Either a Deluxe or a Companion Lean Factory Simulation Kit is required to test out the theories in the hands-on car factory exercise. 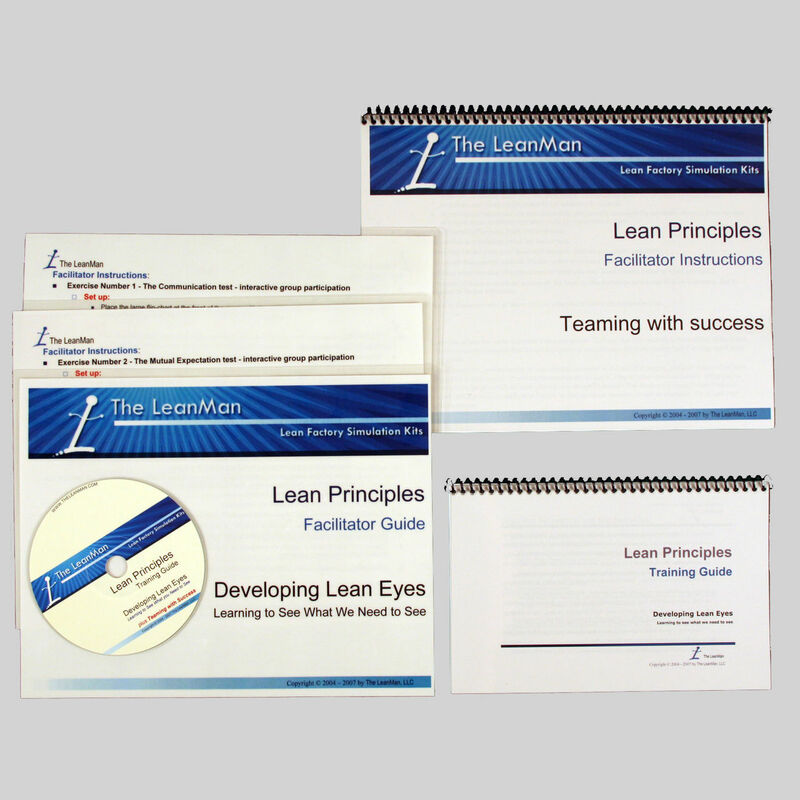 PLEASE NOTE: The Developing Lean Eyes Package now includes the Teaming with Success materials for one single low price.